Justine Hudak-Morgan is a 31-year-old designer, maker, and sole owner of Sanctum Handmade. 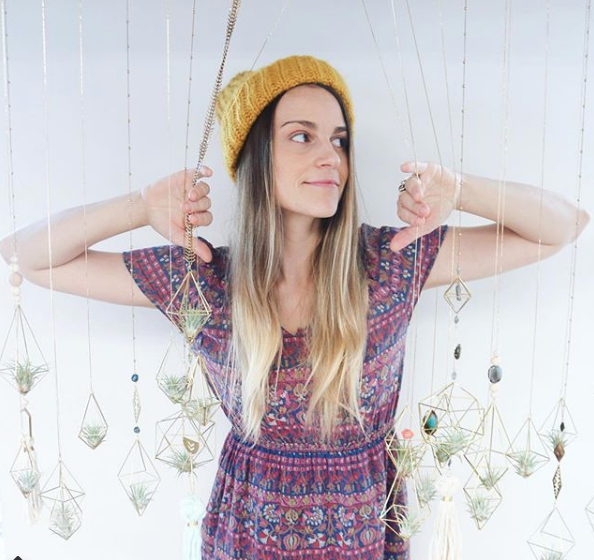 Formerly a jewelry artist whose past businesses include Sage & Indie Jewelry and Luna Rayne Jewelry, Justine started Sanctum Handmade in September of 2017. After less than a year in business, Sanctum Handmade has seen great success on Etsy.com and can be found in 15 boutiques, both local in New Jersey and in other US states. After the birth of her son, the demanding schedule that comes with motherhood caused Justine to shift her career from jewelry design to home decor. She decided to resign as a partner in Luna Rayne Jewelry, a company she co-owned with her sister, Corina Hudak. Justine’s sister continues to operate Luna Rayne Jewelry, while Justine has decided to focus her efforts entirely on creating pieces for Sanctum Handmade, which is a more work-at-home-friendly venture that doesn’t require long hours in a metalsmith studio. Sanctum Handmade combines Justine’s previous experience as a metalworker with her newfound interest in the traditional arts of macrame and himmeli. Justine hand makes every Sanctum Handmade piece in her home studio in Wanamassa, NJ where she lives with her husband and two-year-old son Atlas.